Cool, thanks for sharing this neat piece of artwork! (Ah, the series that got me back into inline skating... :) ). To balance it out, though, you may want to move Kuu (the bird) a bit farther to the upper left, and maybe change the direction he's flying, so he's headed toward Ikki. However, this is really rather a great wallpaper! Thanks so much for sharing! :) . It has a potential, really big one, but you should make those bubbles/circles on the left blue or white, so it would blend with bg more. Same with clouds/mist: its color is oudstanding a bit and they're too thick. OMG! 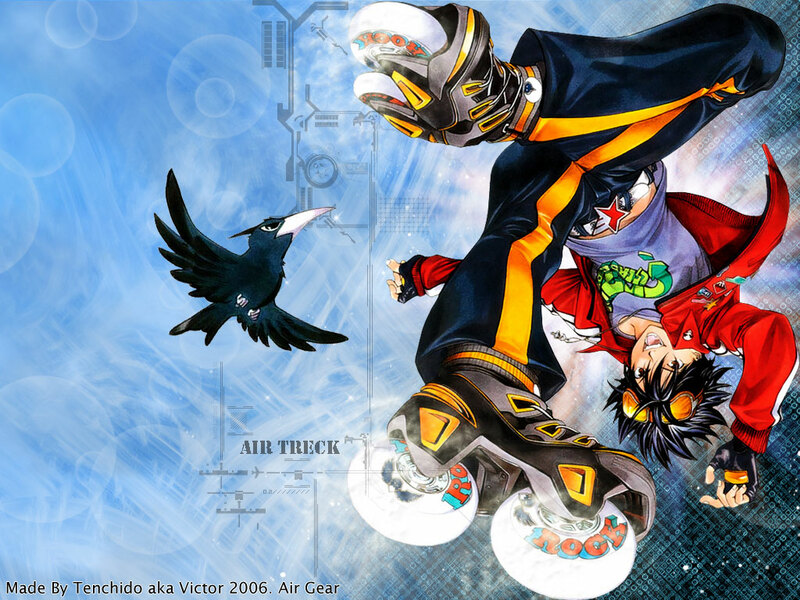 I LOVE AIR GEAR! A nice Air Gear wall. Ikki with his pet crow. Nice. The background looks good too. I dunno, I just really like the background. Such a fun looking wallpaper, totally captures the mood of the anime, thanks for sharing this lovely wallpaper. Cool-looking, enjoyble and colorful wallie. Thx for yor work! Great job on the coloring and background too! A must fav... Thanks for sharing! btw...if u have the time if u have the time can u make ikki with the wing road coz that would be awsome!